Fine Diamater Mineral Insulated (MI) thermocouple probes are suitable for a wide range of industrial processes. Each probe has a plain stainless steel pot seal, rated to 200°C, a spring strain relief and a 1 metre PFA-insulated tails (with bare lead ends and without a plug). Type N are inconel 600 sheathed and type J, K & T are 25/20 stainless steel sheathed. 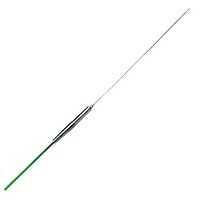 The probes are available with diameters from 0.25mm to 1mm. Note: Type T is not available in 0.25mm diameter.